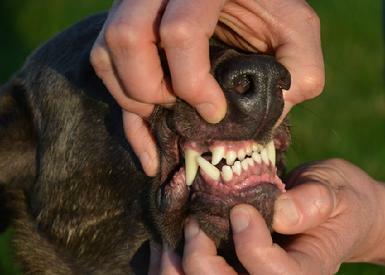 These are terms that refer to dog’s teeth and how they are presented in the mouth. For years, the only folks that really cared about these words were show orientated handlers, since the standard for every breed gives you the type of mouth or “bite” that the breed should have. Other than for the show ring, it doesn’t matter. EXCEPT NOW!! 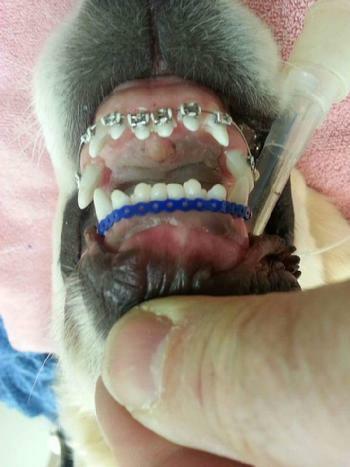 A new trend of dedicated “doggy dentists” are emerging that will convince you a dog needs dental care, removal of teeth; even braces to have a full and happy life. I’m here to tell you that is complete HOGWASH!! Not too long ago, a well meaning, but impressionable person bought a very nice German Shepherd puppy from us. Unfortunately for the pup, the owner was persuaded to sink over $2,000 into dentistry for the pup because his bite was “off”. He went to a doggy dentist, who confidently stated that since the dog had an “overbite” (where the front teeth of the dog don’t meet the bottom teeth in the preferred scissors bite, but protrude over the bottom teeth) he would “have trouble eating, playing ball, and would “never make a police dog” because he can’t bite properly!!! His poor dog ended up having several dental procedures that were COMPLETELY UNNECCESSARY! 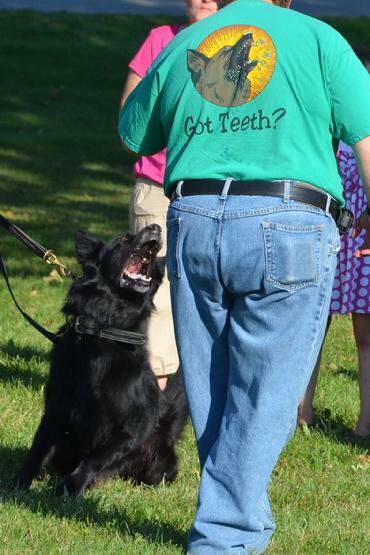 So, here is a explanation of the types of bites, what they look like, and examples of living, breathing, WORKING dogs that have titles, do protection work, eat normally (even raw bones, imagine that!) and need NO DENTAL SURGERY. This dog has an undershot jaw. He will not win in the conformation show ring because of it. 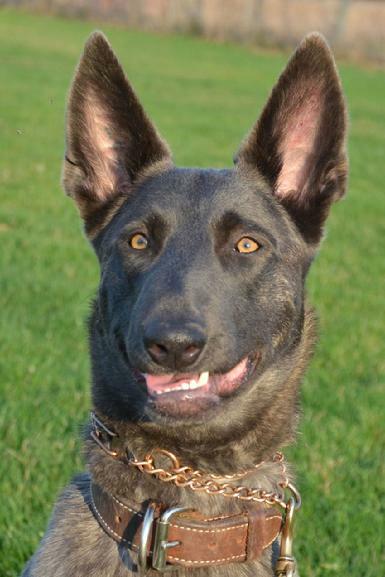 Yet “Dragon” the Dutch Shepherd is a wonderful, active dog that eats raw chicken with bones, plays ball, is titled in French Ring Sport and has been awarded numerous placements in several personal protection tournaments. The positioning of his teeth has little to no impact on the power of his bite… for he bites like a fire breathing DRAGON! 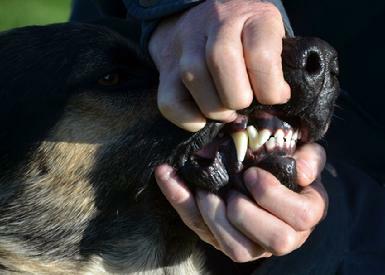 This German Shepherd Dog has a level bite, instead of the correct scissors bite, yet it doesn't slow him down. He eats a raw diet consisting of chicken, venison and beef scrap and bones which his teeth allow him to enjoy just fine. “Jaxon” is titled in nosework and dock jumping, loves to play ball and is an excellent companion for his owner, as well as a superb sentinel and protector for her horse farm. This dog also has an undershot jaw. “Picante” is a Dutch Shepherd competition dog, who at the young age of 2 years is already titled in nosework, lure coursing, dock jumping and rally obedience. She also excels at protection work and will trial in French Ring Sport. A very serious protection dog performing guard duties in the house and yard; yet she eats with her undershot jaw, bites with it and will chew through any bone you give her! Not a conformation show dog, but a very nice, healthy family companion, and will be so for many years. This dog “Griffon” has a wry mouth, the worst bite you can have. Both sides of his jaw (upper and lower) grew at different rates. We noticed his bite was off at five months. Of all the bite “issues” this one is considered the worst, and may have needed some intervention. However, we found, as in most cases, that his mouth worked its way to being healthy and very useful. He has never been to the dentist. He is titled in agility, nosework, dock jumping, lure coursing and rally obedience. He participates in sport protection work and eats just fine. He also loves retrieving whatever you can throw, be it a ball or a stick… you name it, he’ll bring it! Many dogs have one or more missing teeth, mostly pre molars. Once again, intervention is not necessary. The “missing” teeth are usually there, they just didn’t erupt properly. If you surgically remove those teeth from the dogs jaw, you open him/her to infection, pain, and the chance for needing more surgery! The missing teeth are holding their place, so the erupted teeth have something to hold them in place. 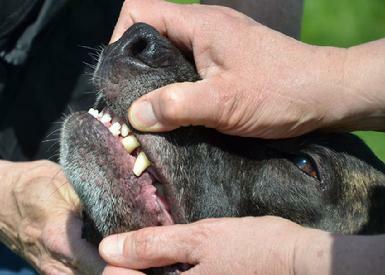 If you take them out, the dog may need other surgeries to keep the good teeth in place! I have been “in dogs” long enough to see a lot of changes. 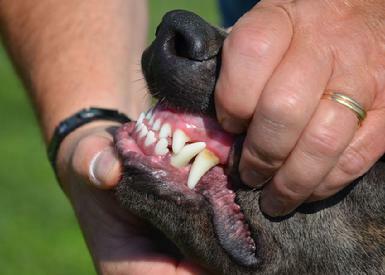 The rise of “Doggy Dentistry” is relatively new, and I’m very discouraged by it. Our dogs have been dealing with less then perfect mouths for ages. Starting to remodel and mess around with nature is NOT necessary. This is a money driven trend, and if people can be convinced their dog needs what amounts to cosmetic surgery, all the better for the bottom line of the dentist. We will NOT condone the mutilation of our pups to line the pockets of this new scam. IF you buy a pup from us for showing in the conformation ring and then for breeding, and you state that as your primary goal, we will of course replace the pup or refund your purchase price. BUT, if you state you want your dog for companionship, for work, for all that dogs can do for and with us, we will NOT refund or replace for an overbite, undershot, wry or missing teeth. It doesn’t make any sense, and we will not be part of it. We urge you to stand strong, since nobody really enjoys going to the dentist, much less have procedures done that are completely unnecessary.